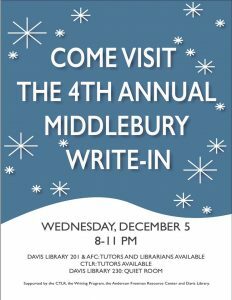 Use interlibrary loan to obtain materials that are not available at Middlebury Libraries. You’ll receive most articles and chapters via email in only 1-2 days! Books and DVDs take a little longer (average 8 days) because they need to be packaged up and shipped. This entry was posted in LIS Staff Interest and tagged Library Spotlight, libspotlight, spotlight on April 10, 2019 by Carrie Macfarlane. Wish you could read over the shoulder of the student in that other thesis carrel? It can be helpful to look at models when you’re beginning your own coursework. 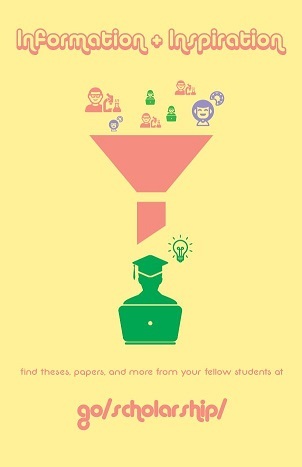 Our online collection of student scholarship includes papers, presentations and projects from Computer Science, Economics, English, Environmental Studies, Geology, History, History of Art and Architecture, Religion and more. This entry was posted in LIS Staff Interest and tagged Library Spotlight, libspotlight, spotlight on March 11, 2019 by Carrie Macfarlane. 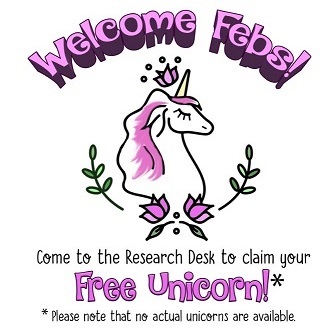 Welcome to the Libraries, Febs! But please do come and say hello to a friendly librarian! We provide expert research help, bookmarks, collectible library pins and (sometimes) candy! Find us at the Research Desk on the main level of the Davis Family Library. No one’s at the Research Desk? Visit us in our offices! Librarians are conveniently located right behind the Research Desk. What about the Armstrong Library? A librarian is available most days at the Armstrong Library in McCardell Bicentennial Hall, too. Just ask! This entry was posted in LIS Staff Interest and tagged Library Spotlight, libspotlight, spotlight on February 11, 2019 by Carrie Macfarlane. Is the outlet out? 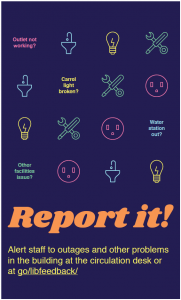 Report it! Is the outlet out? Is the carrel light dark? Please, report it! It’s finals week, and students are making use of every desk, table, carrel and recliner in the libraries. Surely, someone will find something amiss. Please feel welcome to alert library staff to outages and other problems in the building. Visit the Circulation Desk, or report the issue via our Library Feedback Form at go.middlebury.edu/libfeedback. We want to keep our facilities in top-top shape for you! This entry was posted in LIS Staff Interest and tagged Library Spotlight, LibrarySpotlight, libspotlight on December 11, 2018 by Carrie Macfarlane.